“Do you want to see me print someone?” the Great Fredini asked the audience, which responded with energetic applause. “How about you?” he said. I looked to my left and right, but knew he was talking to me. The crowd’s enthusiasm grew and I heard myself say “okay” — more like a question than an answer. I was at the inaugural Young Innovators Fair in the western suburbs of Philly. Surrounded by 20,000 kids and adults, I’d been exploring ten “Innovation Worlds” that spanned more than 12,000 square-feet of space. The brainchild of Chad Collins and his cousin and cofounder Gabe Young, this fair was the perfect place to lose yourself in STEM-inspired opportunities. After examining a triceratops skull, flying a drone and operating a robot, what really turned my head was the 3D printing booth I was now in, featuring Coney Island Scan-A-Rama. A crowd had gathered around Fred Kahl, a.k.a. The Great Fredini, who was captivating the audience by printing miniature replicas of objects right before our eyes. Little did I know that I was next. I was told to step up on a round, raised platform about 24 inches in diameter and stand VERY still, while keeping my eyes focused in one place. 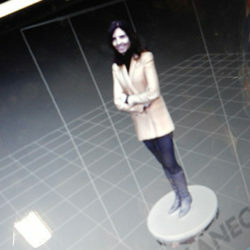 As the platform spun very slowly, my body was scanned. Feeling nervous, I couldn’t help imagining I was on a microwave turntable. But minutes later, the painless procedure was over. I exhaled. Here’s basically how it works: The printer creates three-dimensional solid objects from a printed file. If you are creating something from scratch, you would first use 3D modeling software to create a virtual design in a Computer Aided Design (CAD) file. 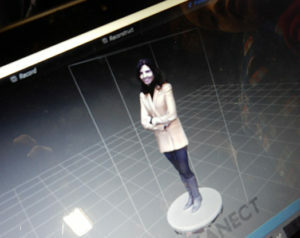 Or if you intend to print an object that already exists, like in my case, you would use a 3D scanner. The 3D software creates thousands of layers, and when the file is uploaded into a printer (which actually did look like a microwave oven), the object is physically created one layer at a time. The result? A replica. Of me! Of course, printed Ellen would be a “mini-me” the size of a Barbie doll. I imagined how I would assign tasks to each 3D copy… one to clean, one to cook and one to do the laundry. But just imagine the possibilities on the horizon. Already there are plenty of brilliant, real-life applications such as medical or product modeling, and so many fun things to create for personal enjoyment from musical instruments to models of your favorite things. Consider if you lost a part to an appliance! Rather than running out to the store to buy a replacement part, you could have a file of the item emailed to you, then print the part out on your 3D printer! What would you print from your 3D printer?